You know, I always wanted to open a online shop that only sells guys stuff cause I thought that there are too little online shop (blogshop) that caters solely to the males man. So I thought maybe I can 'zuan da qian' (earn lots of money) if I sell guys realted stuff online having a blogshop or something lah, but yet I'm seriously too busy to do that and get started, so in the end I give up this idea. I want to sell unique apparels and accessories!!! Mostly, all the blogshop now, are selling the same stuff over their sites which is like totally ridiculous cause basically anyone and everyone will be wearing the same thing as you do!! So I always thought to stand out from the rest..
1. Your blogshop must sell unique stuff which means you got to sell things that are different from the rest of the blogshop, so you win! 2. Your site must be easy to navigate and looks at least professional abit. 3. Your service must be good and prompt enough! 4. Must be establish, and it takes time lah! So out of these few points, this blogshop that I'm going to introduce to you guys has at least 3 out of 4, cause being establish needs to take time I think. They sponsor me 2 apparels from their collection! I really love this khakis alot man!!!! I wore it like almost everyday to school and when I'm going out (you will see me wearing it for the up few coming entries) cause I really like it alot! And they're really nice cause most of their apparels have only limited stocks and they usually just afew pieces, so this khakis that they have, comes it in size 32 only which is quite big for me! So they after knowing I want this khakis right, they actually went alter it to the right size for me man (which is size 30 lah!)!! 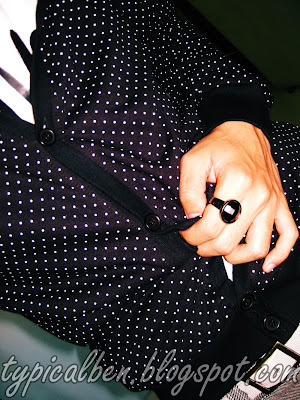 How can I ever resist the temptation of polka dots? I know some people might say that they've seen this before selling outside but if you compare the price that they're selling, it's much more worth it than the ones that you seen outside! I haven't really get to wear this yet cause my bag is also black with white polka dots too, so if I wear this hoodie and carry my bag togther, I'll look totally weird lor! Like as if my whole body is skinned with polka dots! 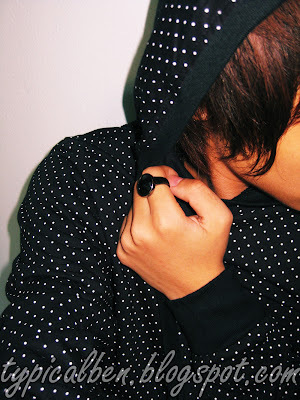 And Angie also like my this polka dots hoodie cardigan alot! So having said so much, do visit dresshimup for nice guy's apparels and accessories (they do sell bags and stuff) and buy it for yourself, your boyfriends or even your friends! Aiya! I'm very hungry now man!! I'm going to end off here and go grab something to eat already, I think mummy bought me mee siam! Weeeeeeeeeeee! p/s: Thanks Rakcent (my FYP classmate) for the help in taking pictures for me! Weeeeee!